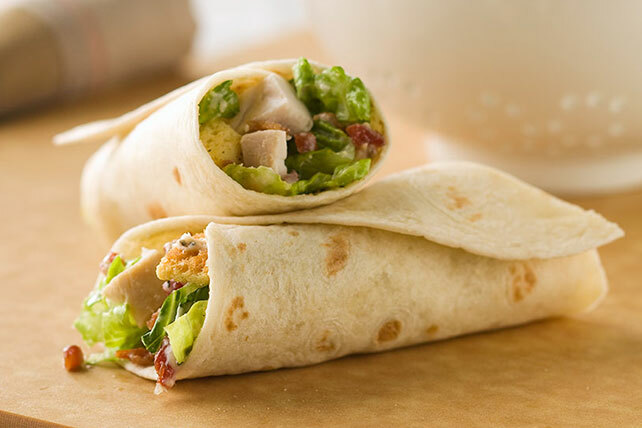 Wrap up your chicken Caesar salad into tasty Chicken Caesar Wraps! These creamy, crunchy Chicken Caesar Wraps can serve four people in just 10 minutes. Place first 5 ingredients in large bowl. Add dressing; toss lightly. Spoon onto tortillas; roll up tightly. Prepare using KRAFT Lite Ranch Dressing. Prepare using KRAFT Finely Shredded Parmesan Cheese.